'When we build, let us think we build for ever' As a craftsman, I work to the tolerances of the eye rather than the micrometer, it would be no exaggeration to say that certain elements of a design may required accuracies the thickness of a line. I'll let you into a secret here, my guiding and woodworking skills are self taught. I've acquired them though a process of refinement and experimentation starting with simple and easy to make designs and slowly evolving them into what you see today. Each time I have a chance to remake a piece I have that wonderful opportunity to refine the design and hone my skills that little bit more and improve on what has gone before. To create such a diverse range of artefacts I have had to master an equally diverse range of wood working and finishing skills. 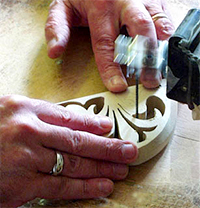 These range from the basic skills through to fretwork, carving and joinery. Experience has taught me that it pays to eliminate imperfections as they occur rather than ploughing on regardless as you end up spending more time and effort at all the subsequent stages having to compensating for them. For this reason the woodworking stage is critical to the quality of the final piece so I make every effort to get it right from the start. This uncompromising standard must be maintained irrespective of the complexity of the piece. 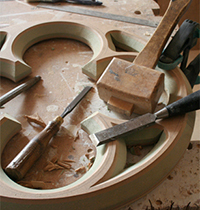 Whether it is one of my relatively simple rectangular clocks or an elaborate cabinet, each and every piece has to be finished to the same exacting standard.